Carcharodon's fan during Roachstomper US Tour 2013. Italian Southern sludge death'n'roll metal band Carcharodon was on tour in the US in October 2013 in order to promote its news album Roachstomper. Discover the beginning of Italian band Carcharodon on the East Coast of the US. Carcharodon begun its tour in South Carolina before hitting the road to Florida and Louisiana. 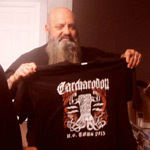 Southern Death'n'roll metal band Carcharodon continues Roachstomper Tour through the US and stopped in South Carolina. Stay tuned, more Roachstomper US Tour 2013 and Carcharodon videos are coming soon !